Bachelor Winter Games Host Chris Harrison: Get Ready for a 'Surprising' Marriage Proposal - Integration Through Media ....! Every week, Bachelor Winter Games host and executive producer Chris Harrison is giving PEOPLE his behind-the-scenes take on the latest episode. Follow him on Twitter at @chrisbharrison. Welcome back! I think the Bachelor Winter Games could very well be the best of all the Bachelor shows. The romance, the emotion, the international element, the, uh, almost athletic events. It really is a tour de force. As I told you before, we had planned to do downhill skiing as the first event, but we just didn’t have enough snow to make that happen. Thankfully, the snow came in and at just the right time. As I expected, some of the “athletes” really struggled. Yuki and Josiah spent more time in the bushes than on the slopes. Michael G. walked the entire way down. And Ashley. Oh, Ashley. She ended up in the netting and had a lot of trouble getting out. How Hannah Storm kept a straight face through all that, I have no idea! Dean and Lesley took home the date cards with relative ease, and back at the villa it was just a matter of who was going to get their extra date. It was no surprise that they handed the date card to Kevin and Ashley because even they could tell that Kevin and Ashley really needed that time together. I could really see that relationships were evolving, and quickly. For those not in relationships, however, things were at their breaking point. Let’s talk about Ben for a minute. He was really struggling. He gave it a shot in Vermont, but the breakup with Lauren was obviously still on his mind while he was there. That was such a tough conversation we had, but Ben and I are close friends and it felt good for both of us to just get it all out there. One day — and he’s not far away — Ben will be ready to open himself up to love again. With Ben leaving, the writing was on the wall for Michael and Yuki, the only two people still at the villa but not in a relationship. Michael knew his time had come, and though you didn’t see all that much of him on the Winter Games, it was tough to see him go. Michael is smart, funny and capable of having an intelligent conversation with anyone about anything. Good guy. And then there was Yuki. That young woman just lit up the Winter Games with her charismatic personality. It didn’t matter that she doesn’t speak perfect English; everyone could understand her. That said, I thought it was important that I brushed up on my Japanese for my conversation with her. Am I fluent in Japanese? No. Can I order a few things at the sushi bar? You bet I can. And Yuki, if you are reading this: あなたがいなくて寂しいです. The kissing competition was meant to be just good fun. Rachel, JoJo and Arie were kind enough to travel through a blizzard to do the judging. I mean, they’re experts, right? Yet what transpired was absolutely insane. Stassi breaking down in tears was unexpected, and yet another example of how cultural differences played a role at the Bachelor Winter Games. But then there was Ally. I could tell that Ally looked a little uncomfortable during the competition, but I had no idea she was feeling that sick. Was it just something she ate, or was it — as Bibiana suggested — her body rejecting Josiah? We’ll never really know, but it did make for the most uncomfortable kissing competition you could possible imagine. Regardless, I think Josiah and Ally both knew it was time to say goodbye. As for Clare and Christian, I know there has been a lot of talk about Jacuzzi-Gate and who was ultimately responsible for all the miscommunication between them. Was it Clare’s fault? Was it Christian’s fault? Was it a language barrier? I’m not sure, but if there is one thing I am sure of it’s that I have always been and will always be Team Clare. Do not underestimate her strength. If Christian had been the right guy, she would have made it happen. He wasn’t, and she knew it. WATCH: What Does the Cast of ‘Bachelor Winter Games’ Really Think About Arie Luyendyk Jr. and His ‘Pillow Lips’? That’s all for this week. 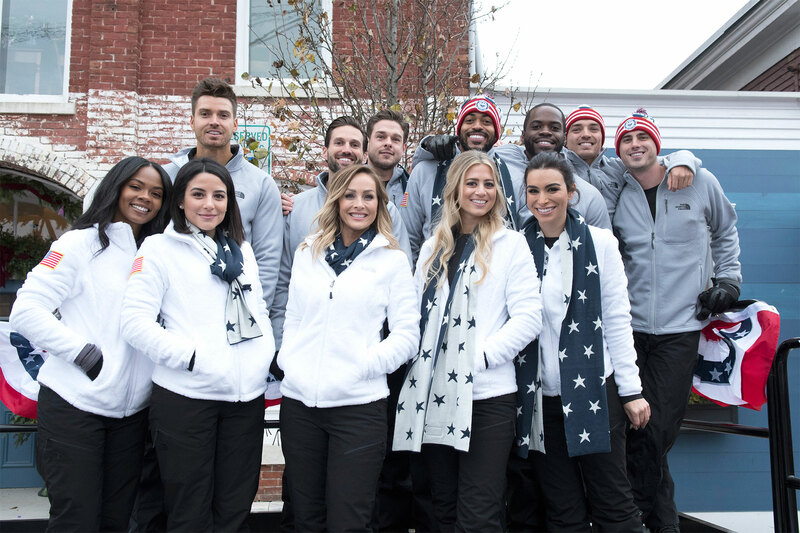 Thursday night is Winter Games’ finale, and it doesn’t disappoint. Nancy Kerrigan is one of three former Olympians who makes a guest appearance to help the final four couples with their ice dancing routines. For one couple, however, things don’t work out as planned. It’s one of the most heartbreaking breakups you will ever see. And then immediately following is the reunion show when all your favorites come back to fill us in on what happened since they left Vermont. One woman angrily breaks down in tears when she comes face to face with the man who broke her heart. It’s tense, raw and almost hard to watch. As dramatic as that is, nothing compares to the surprising, romantic and beautiful marriage proposal that will have all of Bachelor Nation talking. Yes, that happens! Tune in Thursday! The Bachelor Winter Games airs Tuesdays and Thursdays (8 p.m. ET) on ABC.